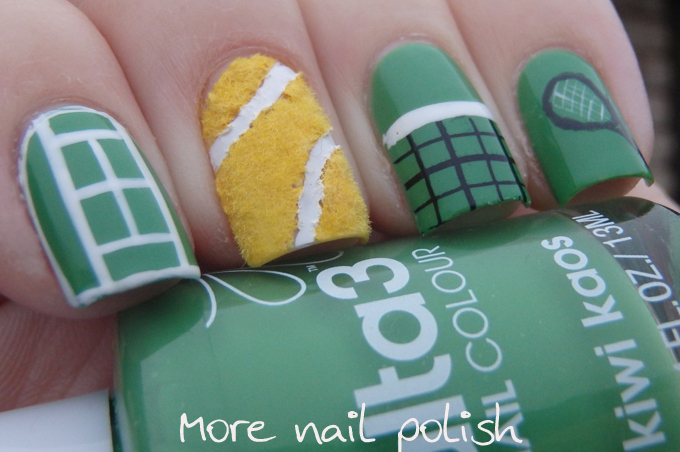 I created this fun tennis themed mani earlier this week, when 19 year old Canberrean Nick Kyrgios beat No.1 Rafael Nadal at Wimbledon, creating quite a local news story here in Australia. I don't get very many opportunities to using flocking powder, but creating a fuzzy tennis ball was definitely a great chance to flock it up again. I used sticky tape cut into thin curves and taped off the white parts of my nails. I then painted yellow polish and top coat and then covered my nail in fuzzy yellow flocking powder. While it was still wet, I pulled the tape off. I then carefully used a striping brush to paint white in the grooves. I originally tried doing this with a white base taped off and then putting the flocking powder on, but I didn't wait long enough for the white base to dry and created a big hot mess. 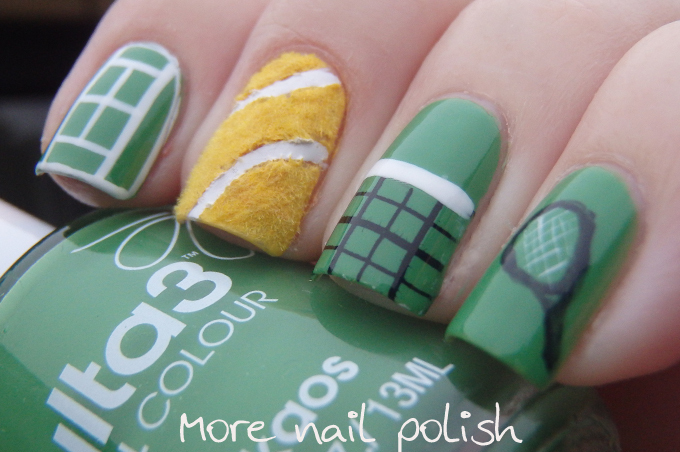 Focking powder manis are really fun, probably not designed to be worn for more than a day or so, but these ones certainly still looked good at the end of one day and were still nice and fuzzy too. I purchased my flocking powder from the Born Pretty Store. For my other nails, I did a base of Ulta3 Kiwi Kaos and then painted various designs in free hand. 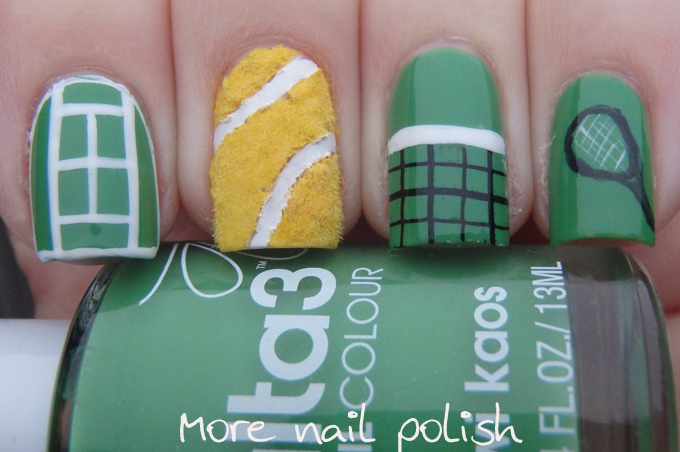 On on index finger I created a framed mini tennis court. 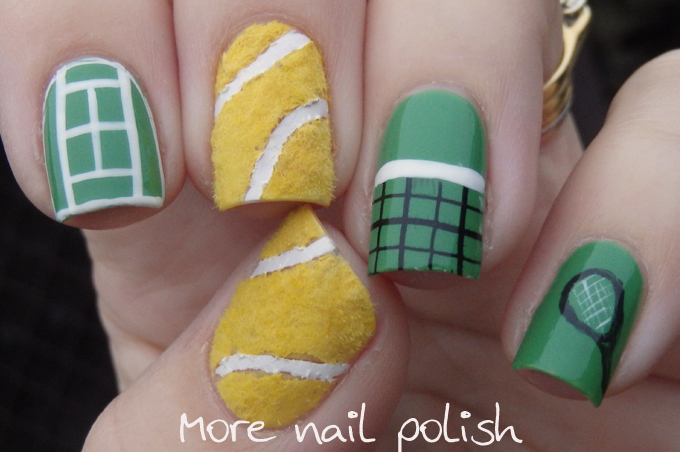 I did a net on my ring finger and a racquet on my pinky. That is so cute! I am definitely not talented enough to do that!